On a busy day, we'll have three or four boats go by. We live in the midst of a fairly sensitive environment, with fragile banks and there are signs which declare the place to have a 6 knot speed limit. To obtain a boat licence one must also learn that one can't travel at more than 4 knots within a certain distance of the shore, yet people persist. This bloke is better than most, sure he's travelling flat out, but his boat is perfectly trimmed and the wash he created was probably no more than if he'd been travelling very slowly. 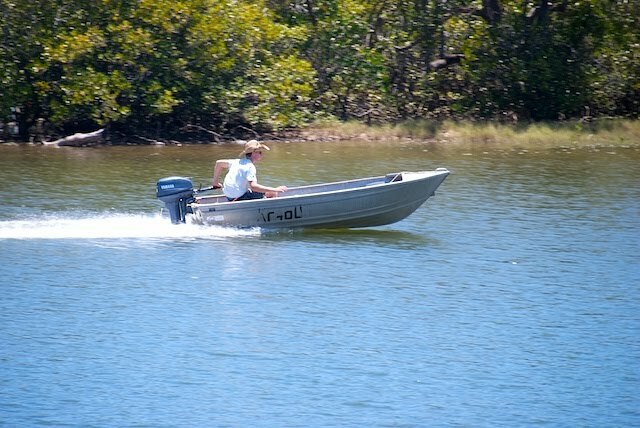 He doesn't have much chance of being reported to the Water Police either, given the state of his registration number! I like the contrast with the old guy paddling slowly yesterday. It was strangely coincidental Joan, but in the book of the blog, they are neatly juxtaposed as well. I suppose gunplay is out of the question? You Aussies are so much More Civilized than we Oregonians. Gunplay eh? :-) Anytime you want to have a lovely week or two in the sun, feel free to bring your shootin' irons!